Non-insider Microsoft Lumia 950 and Lumia 950 XL updated to Windows 10 Mobile build 10586.36? 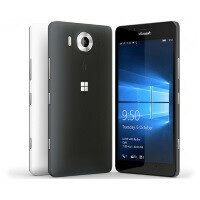 Microsoft Lumia 950 and Microsoft Lumia 950 XL units that previously did not receive the update to Windows 10 Mobile build 10586.36, have started receiving it at last. Windows Insiders in both the fast and slow rings already had the new build sent to them OTA. That would leave non-Insiders left, but there is a chance they are not the target of today's update. Because a number of Windows Insiders were stuck on build 10586.00 and could not receive 10586.29 and 10586.36, this update could be intended for them. If that is the case, then Windows non-Insiders with the Lumia 950 or Lumia 950 XL might not be receiving the latest update at this point in time. The reason that the 10586.36 build of Windows 10 Mobile is so important, is that it is the last update that Microsoft is pushing out to its mobile devices this year and includes bug fixes and performance enhancements. As for older Windows Phone users waiting for their phones to be updated, that will not take place until early next year. Why is it taking that long ??? Less than a year out, I don't see it as long in the tooth. When a 30 buck windows phone can run win 10 beta, it comes to show the OS is far ahead in compatibility than others.